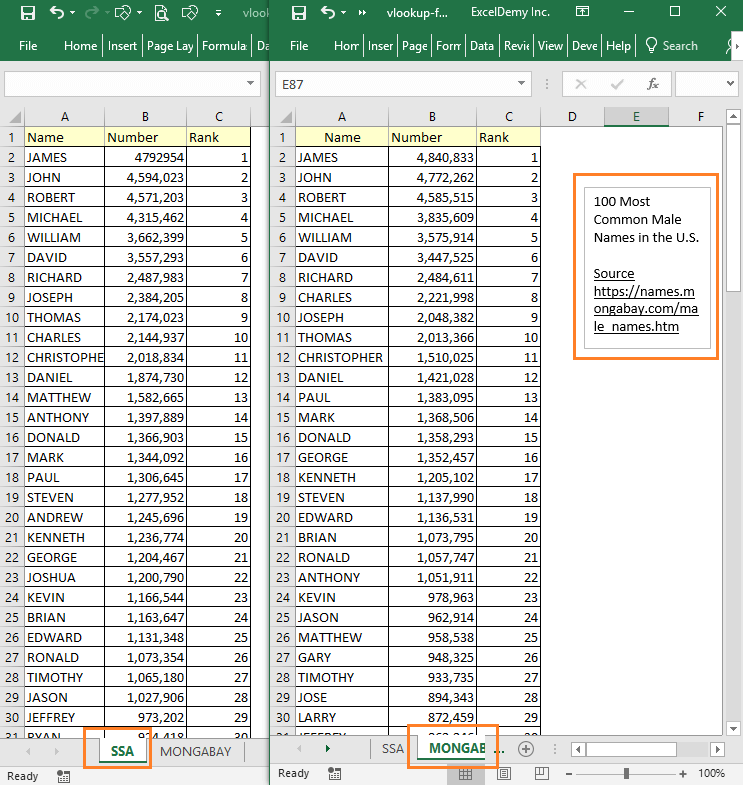 If you have two big columns and you want to compare them, you can use Excel’s VLOOKUP function. 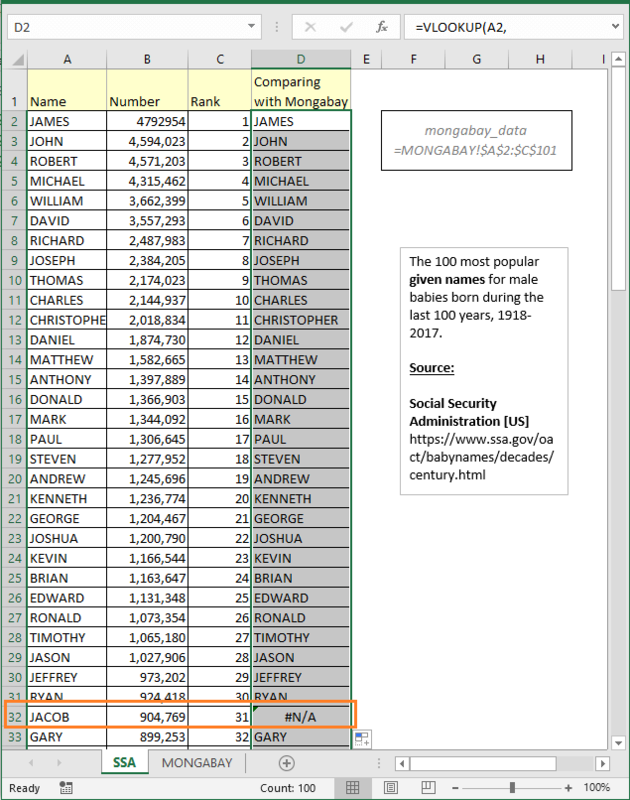 In this article, I will show how you can use VLOOKUP formula to compare two columns in different sheets. We have two worksheets (SSA and Mongabay) as below. 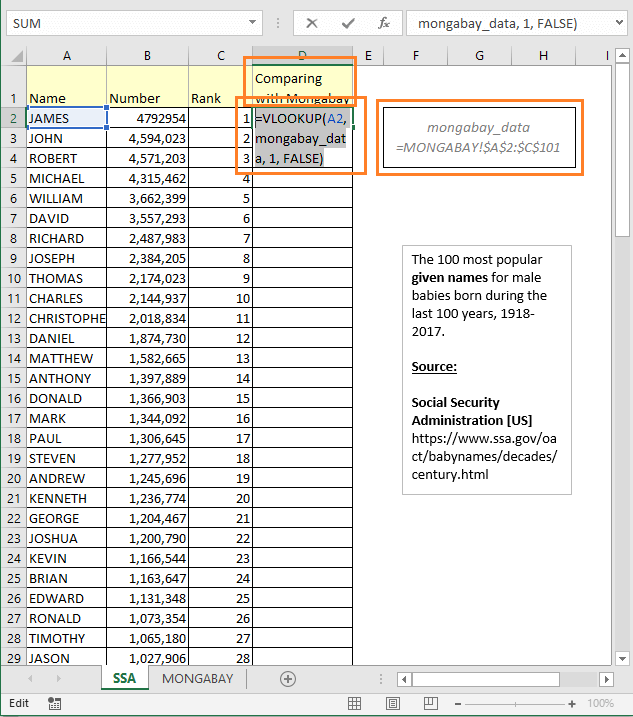 In the SSA worksheet, you will find the 100 most popular given names for male babies born during the last 100 years, from the year 1918 to 2017 (source). We shall compare these two worksheets using Excel VLOOKUP formula. 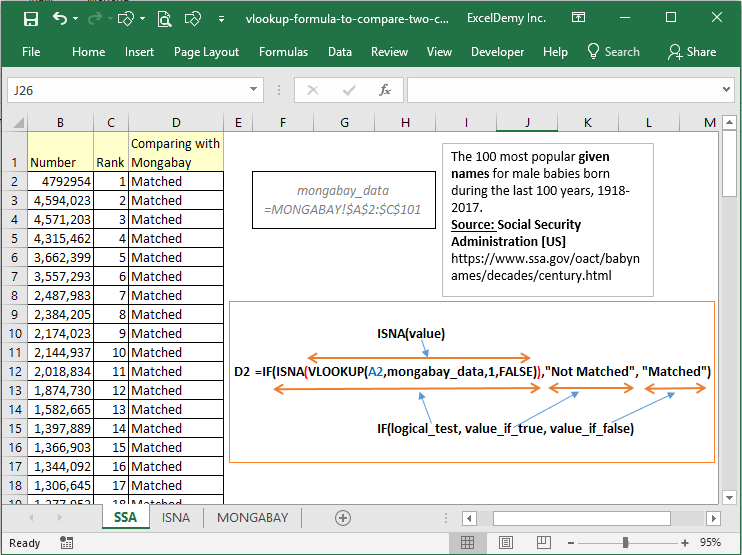 Let’s compare the SSA worksheet names with the names of Mongabay worksheet. 2) Press Enter. You will see James name is showing in the cell. James is showing in the cell because James name is found in the Mongabay worksheet. Now double-click on the Fill Handle icon on the bottom left corner of the cell D2. Double click on the Fill Handle to fill all the cells with the formula of cell D2. 3) The formula of cell D2 will be copied down to all the cells in the column. We get the first mismatch in the D32 cell. The formula here is showing #N/A error. So, the formula did not find a match for the name Jacob. At cell D32, we get the first #N/A error value. So, Jacob name is not matching. 4) More mismatches are here. So, these names (Alexander, Tyler, Nathan, Zachary, Kyle) are losing their zeal in recent time. This is a very straightforward VLOOKUP formula. 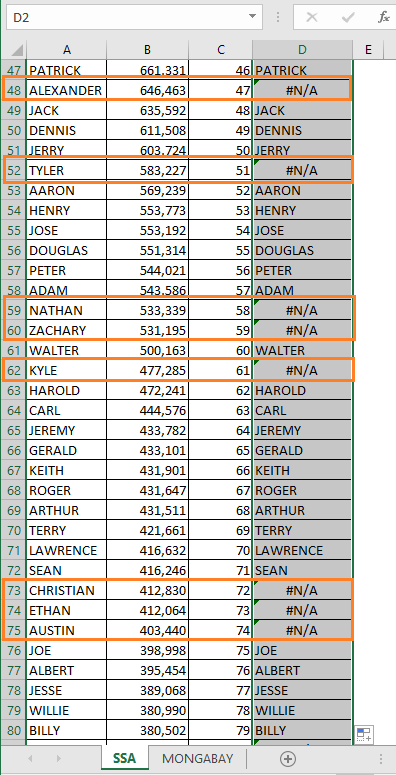 Here is a brief of Excel VLOOKUP function. If you need a revision of this function, pass some time on the following image. This time, let’s use this formula in cell D2 and then copy it to other cells of the column. You see, this time cell D32 is not showing the error value. Rather than it is showing this text "- -[Not Found]" value. To understand this formula, you have to be familiarized with the IFERROR excel function. As the value of IFERROR function, we have input our VLOOKUP formula. 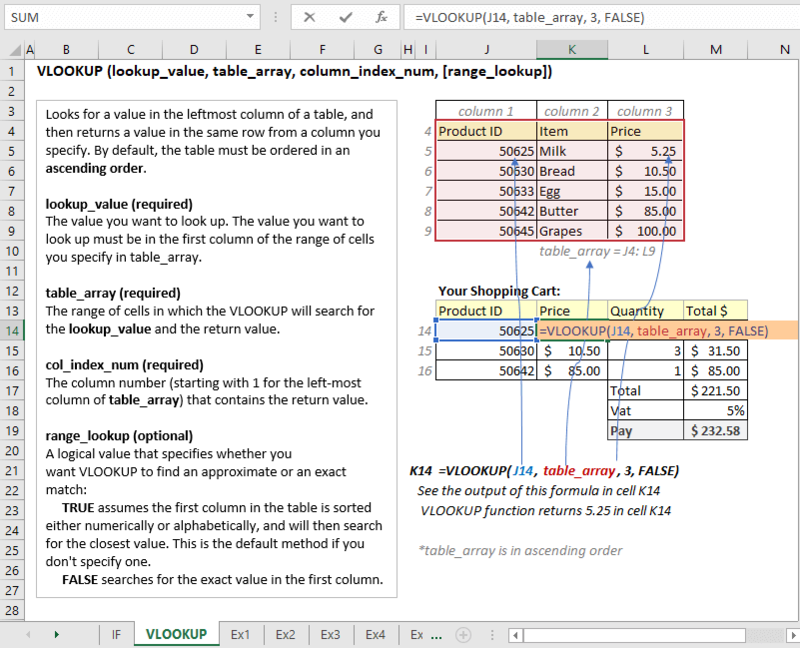 So, if there is no error, the output of the VLOOKUP formula will be the output of the IFERROR function. As the value_if_error argument, we have passed this value, “- -[Not Found]”. So, if IFERROR function finds an error in the cell, it will output this text, “- -[Not Found]”. 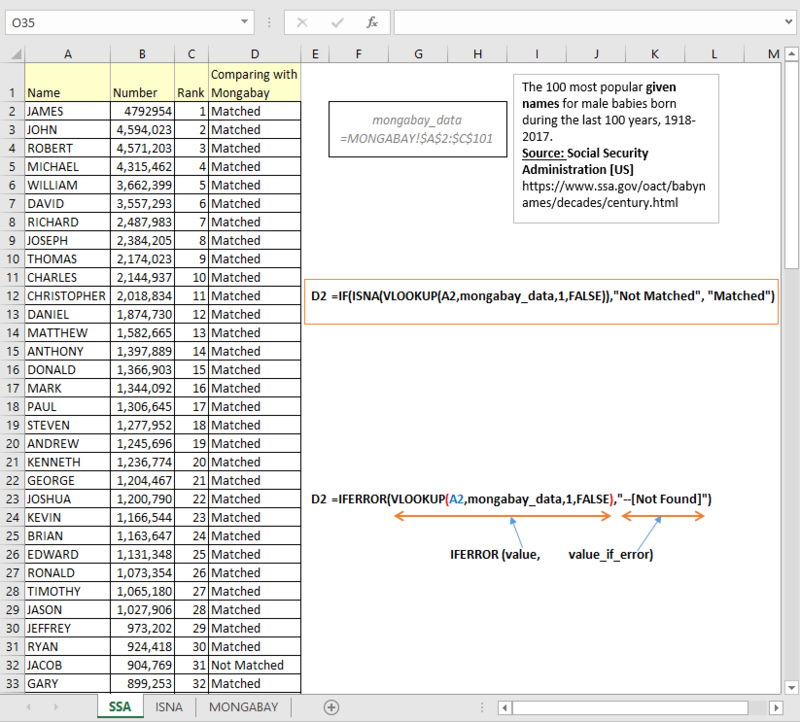 We can also use IF, ISNA and VLOOKUP combo to handle that #N/A errors. And then use this formula for other cells in the column. To understand this formula, you have to know how IF and ISNA functions work. Take a look at the following image to see how the IF function works. And this is how ISNA function works. Let’s now see how the following formula works. 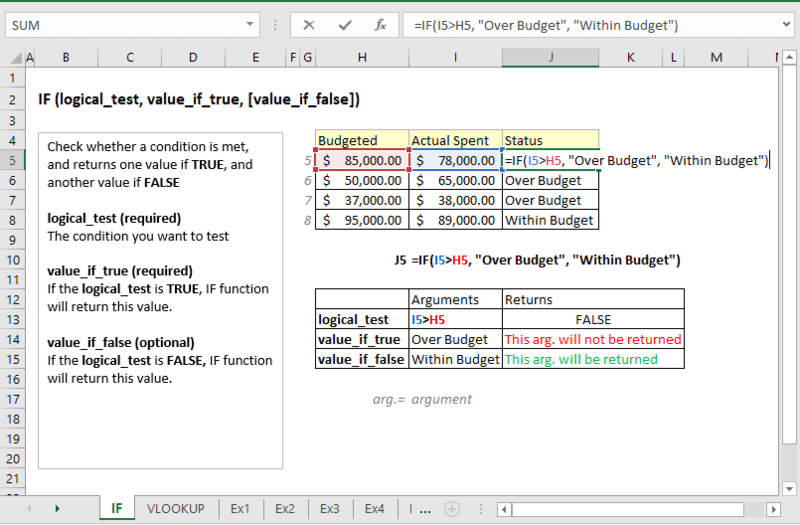 As the logical_test argument of IF function, we have passed the ISNA function and ISNA function holds our VLOOKUP If the VLOOKUP formula returns a #N/A error, ISNA function will return the TRUE value. When the logical_test is true IF function will return this value: “Not Matched”. If the VLOOKUP formula returns a value (no error), ISNA function will return FALSE So, IF function’s logical_test argument will be False. When logical_test is False IF function will return this value: “Matched”. 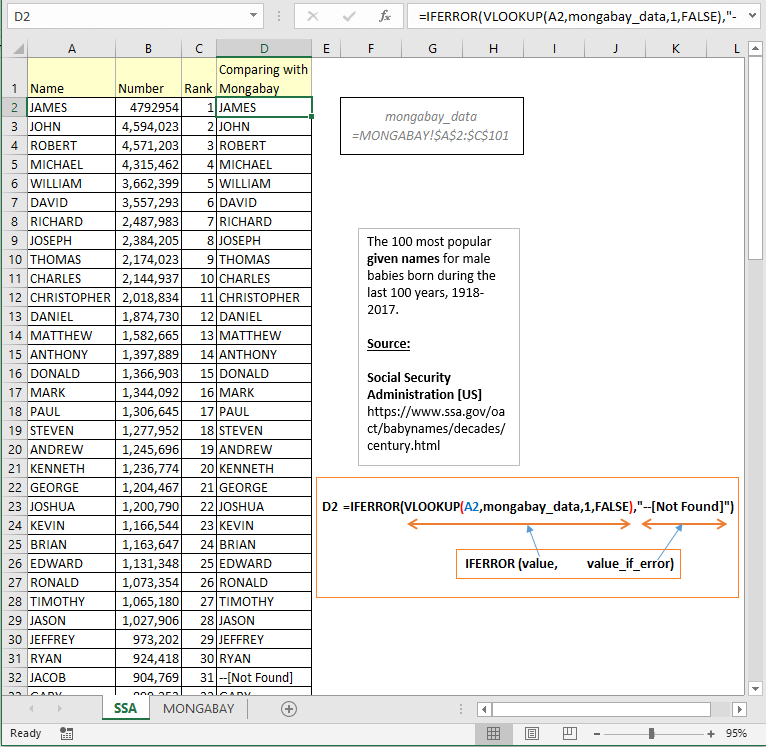 So, these are the VLOOKUP formulas that you can use to compare two columns in different Excel worksheets. Hope this helps.